I earned a joint B.S. degree in Biology and Psychology and an M.S. degree in Biology with a concentration in Ecology before entering CUNY. I am currently a second year PhD student, with eight years of research experience in behavioral neuroscience and pharmacology, and a background in studying anxiety in rodents. As a graduate student, I am continuing to use rodent models to understand the neural circuits underlying mental illness, with the goal of developing novel treatments. I am combining mouse genetics, optogenetic stimulation, and awake behaving electrophysiology to investigate the effects of Serotonin on circuits underlying fear learning. In my free time I build Lego kits and am trying to refine a number of tempeh recipes. I received a BS from Barrett Honor's College at Arizona State University. As an undergraduate my work focused on studying the cognitive impacts of endogenous and exogenous hormone exposure on female rodents. I am particularly interested in understanding the overlaps of rodent research and human work, and focused this curiosity into my honors thesis wherein I adapted a traditional rodent maze to be performed on human participants. After graduating I spent time working at Barrow Neurological Institute performing neuropsychological testing, fMRI and exploring the diagnostic potential of perfusion MRI for patients with brain tumors. My graduate interests focus around understanding the neurobiological underpinnings of how animals discriminate between fear and safety learning. I graduated from the Macaulay Honors College at Hunter College in 2015 and majored in neuroscience. My hobbies include reading late 18th century German novels, boxing, and renaissance art history. I'm currently a senior majoring in Computer Science. I plan on applying to medical school in the near future. I'm fascinated with the ability to use of mouse models to study the relationship between neural circuits and social behavior. I love to visit different cities and try different foods. I also enjoy playing volleyball and tennis during my free time. From programming behavioral conditioning paradigms to capturing images of desired tissue samples on a microscope I am familiar with a number of respectivetechniques and tools. Particularly, I help design and program behavioral paradigms on Med-PC, prepare and integrate optogenetic equipment, and help arrange the BlackRock Microsystems equipment for action potential analyses. 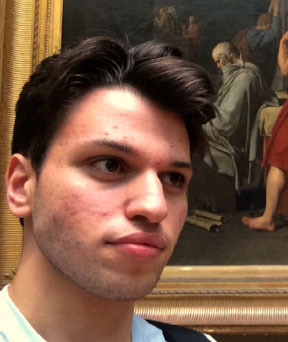 My name is, Itzik Nahmoud, I am a 3rd year undergraduate student at Hunter College pursuing a Biochemistry degree, a minor in philosophy, and a career in medicine. This lab is exemplary of the advancing technological updates into scientific studies and am honored to be able to gain experience using them throughout the experimental investigation. My name is Rebecca and I am a sophomore at the Macaulay Honors College at Hunter College. I am interested in the neural circuitry underlying fear learning and hope to obtain a PhD in neuroscience after graduating college. When I am not studying or in lab, I am practicing piano or deciding which memes to send to my friends.